I'm particulary fond of spiralized kabocha, but there are tons of squashes and other vegetables to choose from. I originally bought a Joyce Chen Saladacco Spiral Slicer, which was a piece of junk, despite being recommended by a ton of raw food sites. Though it's cheaper than my recommendation, it doesn't slice all that well. It requires that your vegetables be 1 inch in diameter and 3-1/2 inches in length. After it's done you're left with an inch of unused vegetable that it can't slice. The blades easily pops out of the machine if pressed the wrong way, and the two sections don't separate well. It's shoddily built, and I wouldn't suggest it to anyone. The Benriner Spiral Vegetable Slicer, on the other hand, is a joy to use. I bought it after it was recommended to me by a raw food chef, and she was completely correct in her praise. It's built like a rock and offers four different blades that allows for a selection of cuts for salads, garnishes, pastas, etc. Clean up is quick and easy. If you're interested in creating meals that are aesthetically appealing as well as tasty, the Benriner is a great tool that gets the job done. 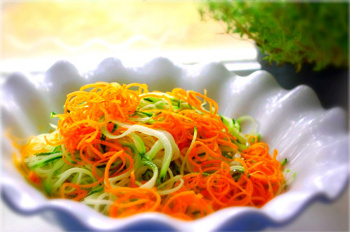 Use this spiralizer to make delicious meals on a healthy raw food diet. 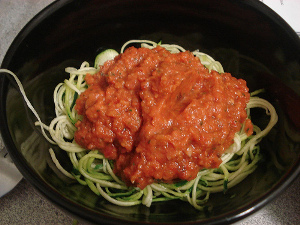 Get great raw dressing and sauce recipes to put on top of spiralized vegetables. Find other raw food product recommendations here.